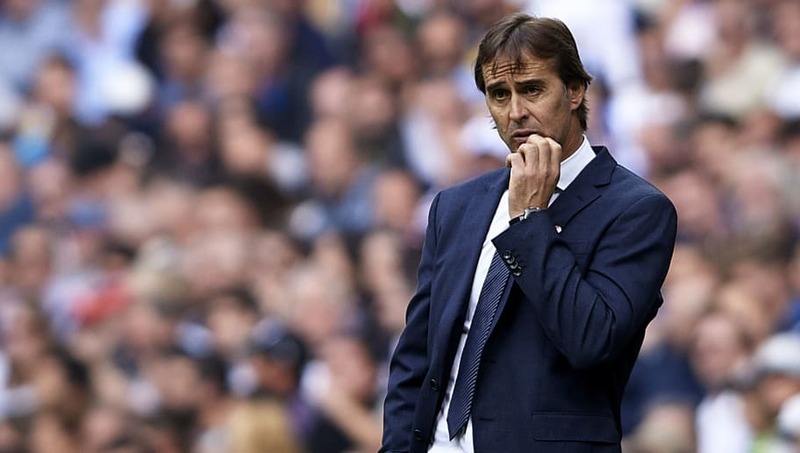 Word in Spain is that Real Madrid boss Julen Lopetegui's days in charge of Los Blancos are numbered. And, according to one publication, the former Spain manager could be relieved of his position in a matter of hours. The leading candidate being touted as his replacement is former Madrid player Santiago Solari, whilst former Chelsea boss Antonio Conte has also been named, with the Italian currently out of a job since his parting ways with the Blues during the summer. Solari, meanwhile, works as the Castilla coach (Madrid's B team) and has the team in second place in Segunda B's Group 1. Marca claims that the 42-year-old Argentinian is viewed as a higher priority than Conte. Former Paris Saint-Germain coach Laurent Blanc is also thought to be on Madrid's shortlist, while ​Tottenham's Mauricio Pochettino is reported as being the chief option for a summer appointment. However, Spanish football expert Guillem Balague has cited information from TJ Cope, claiming that Lopetegui will not be fired this Sunday and Los Blancos are leaning towards a more experienced replacement like Conte. The Italian won the Premier League title and the FA Cup in his two years at Chelsea, but his fractious relationship with the Blues board saw him fired during the summer.